I’m excited to tell you about a project I’ve been working on for a few weeks. 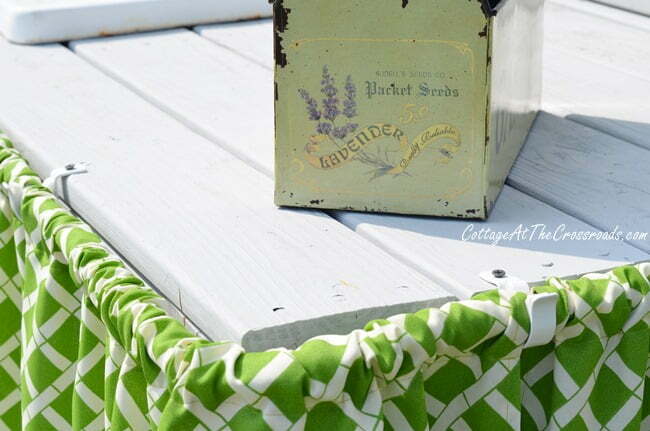 It’s our potting bench redo which now has a cute, flirty skirt! If you remember, we had this outdoor potting bench built a couple of years ago because I wanted A Sink in the Garden. Well, it has certainly been handy, but it had become a little unsightly because all the things that we store on the shelf were visible. So as part of our “prettying up the garden” plan, I decided that the bench needed a skirt. It was about the same time that I was contacted by the Online Fabric Store asking if I might have an outdoor fabric project. DID I? Why, yes, I knew exactly what I wanted to do. I was so lucky to be able to work with the Online Fabric Store and Premier Prints for this project because they provided the fabric! Isn’t it pretty? If you aren’t familiar with Premier Prints and their fabulous selection of fabrics, you need to check them out at Online Fabric Store. Many of the fabrics are on sale right now including this Premier Prints Outdoor Cadence Greenage fabric that I selected for my project. 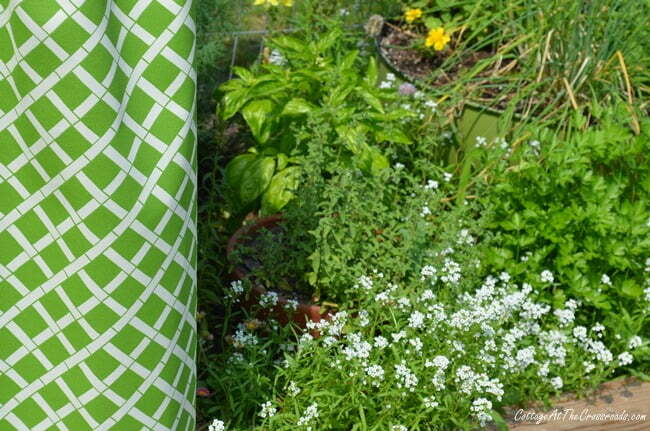 I chose this fabric because it’s almost the same shade of green of most of the herbs in my little herb bed beside the bench. So before the fabric arrived. Leo pressure washed the bench but I wasn’t liking it’s uneven natural color. I picked out a solid stain in Cape Cod Gray and stained the bench. 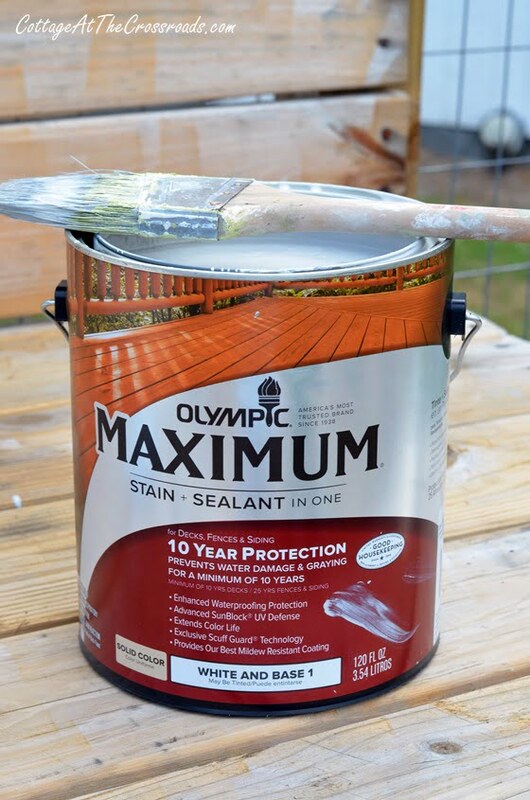 I was going for that silvery gray color that treated wood eventually weathers to, but I didn’t want to wait years for that to happen. 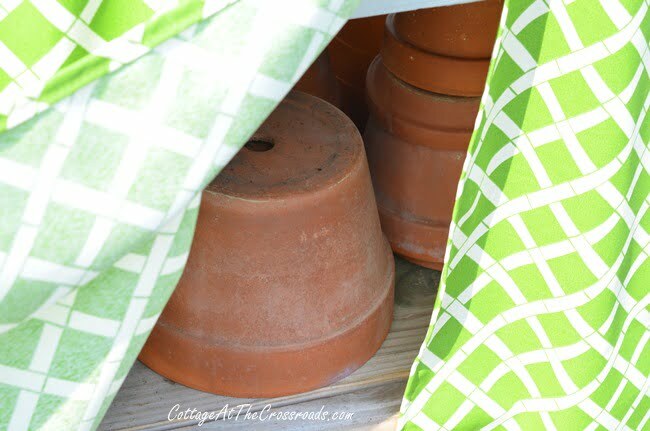 While waiting on the skirt to be made and the curtain rods to arrive, I got busy spray painting some pots and accessories to use on the bench. 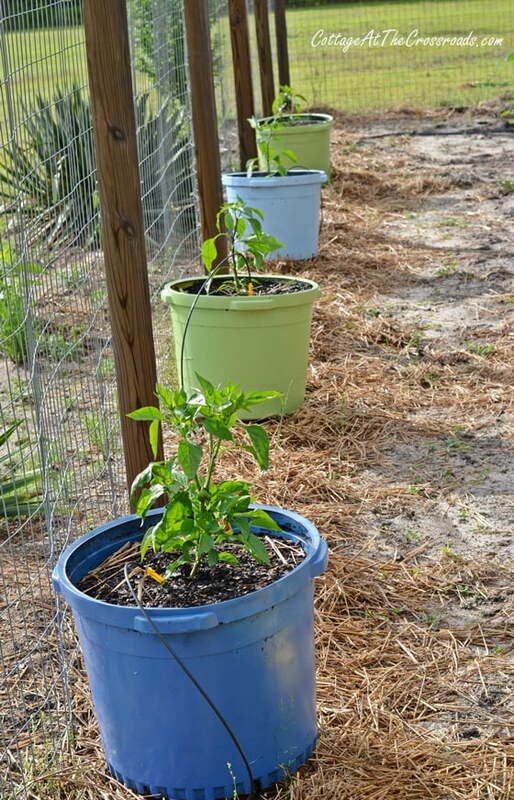 Earlier this spring, we had freshened up these painted plastic pots by repainting them in shades of blue and green so I had plenty of spray paint in these colors. 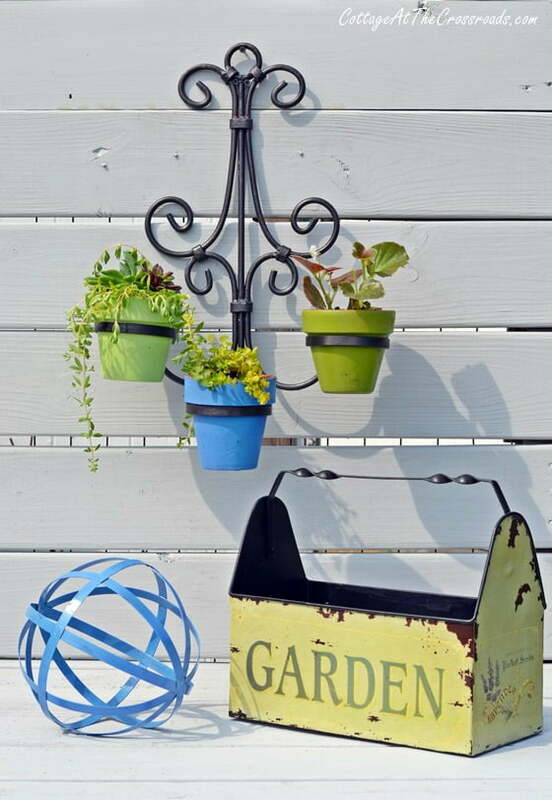 Here is a little blue orb and some small pots painted in those colors. Leo added these two shelves so that I’d have a place to store my trowels and other tools decorative items. 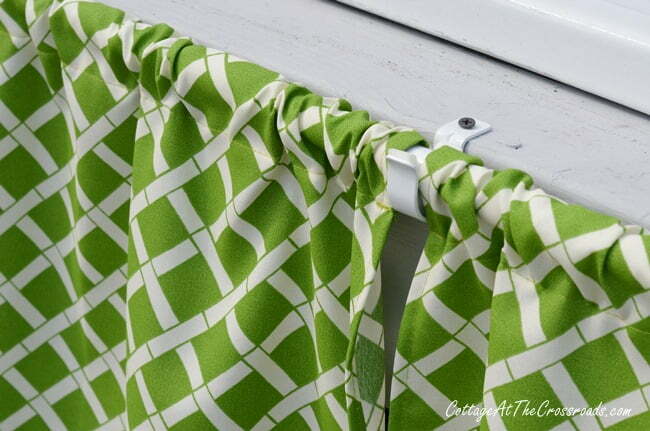 Here you can see how we placed the end brackets to hold the curtain rod when the skirt was ready. Other brackets hold the rod securely in place while a corner connecting piece bends around the corner. The panels meet at each place where there is a bracket. The openings allow for easy access to pots and supplies that are stored on the shelf underneath the bench. The skirt is not touching any soil. There are landscaping timbers all around the bottom along with landscaping fabric covered with straw. There is some soil in front of the sink, but we have sprigged some centipede grass in that area which should cover the soil soon. Isn’t it pretty? You can see a few things that I’ve put on the wooden fence panels that we added to this corner a few months ago. And the vintage watering can got an impromptu floral arrangement of onion and arugula flowers growing in the garden. 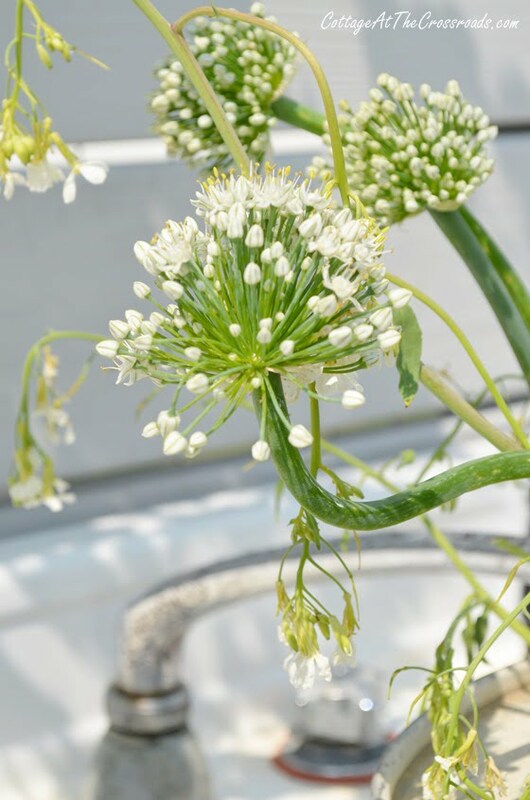 Have I mentioned how pretty I think the onion flowers are? See the little tote that says “Garden?” We’re going to start selling those in our shop soon. I have more plans for turning this corner into an outdoor eating area so that we can enjoy the garden fully. But right now, I’m just amazed at what the potting bench skirt has done for this area. And a great big thank you to my friend Brenda for sewing the skirt for me! Just joined your page. Could you share what type of fabric please? Is it outdoor fabric? 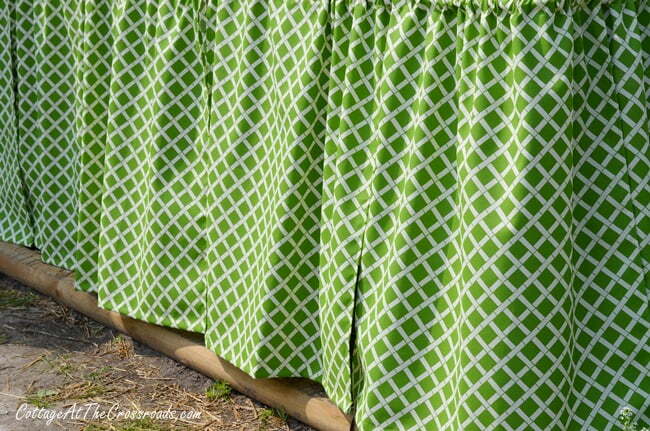 Yes, it was outdoor fabric made by Premier Fabrics. I have been so pleased with how it has held up in the weather for the past two years! Oh Jane, I love it! Love the color of the fabric, it is so fresh looking. You make everything look so wonderful, even a work space! Wow…love that fabric. The color is stunning and I really love your creative project! That is soooo cute Jane! and you can hide all sorts of stuff under it! Oh I love it. And you even have a sink. I love how you painted the pots to match. Thanks for sharing. I am following you now. So cute!! I love your fabric choice!! This is lovely! It adds a finished look to that corner of your garden. Is it coated? Has it been rained on? Your new skirt totally makes the area come alive, and the green and white printed fabric was a perfect choice! 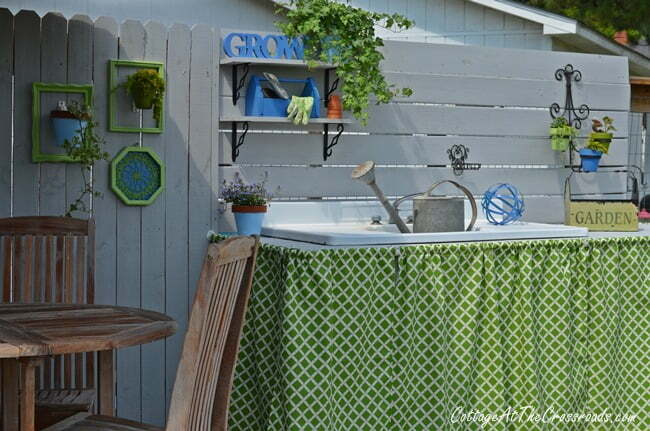 Beautiful, beautiful Jane….I have a skirt on mine; however, it is very sad looking as it has been in the elements for over a year…so you have inspired me to change mine out….I so love the entire potting bench area and the colors are amazing!! !….Great job!! !…it is such a happy place to be!! 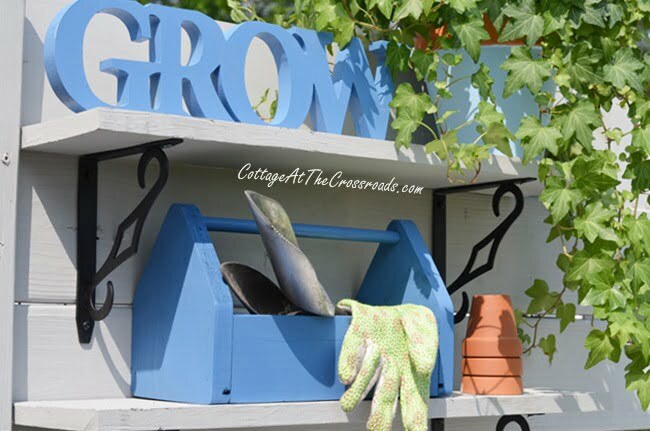 I love your potting bench! 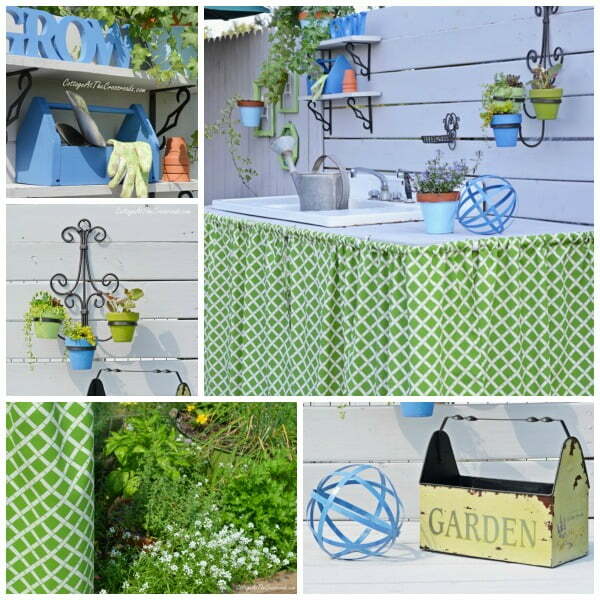 The skirt really adds a fun touch..love that color green and the pattern is perfect for outdoor gardening. Wow what a huge potting bench. Now that is super cool and would love to have something that large!! I just saw this same fabric at Christy’s blog. 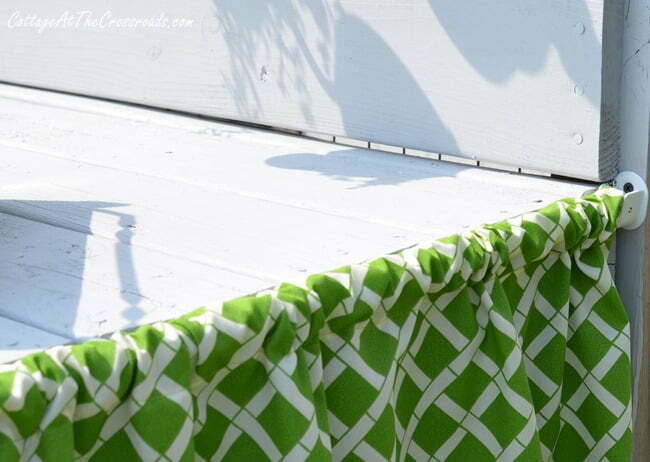 Love the freshness of this fabric and the color reminds me of fresh cut grass, without the sneezing, LOL. 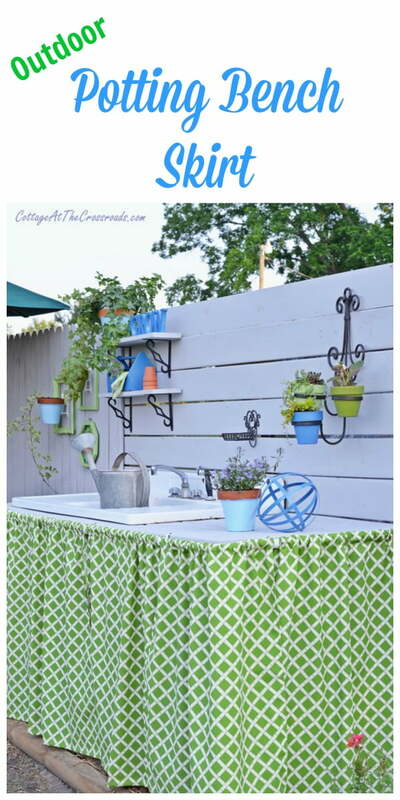 I wish I had a potting bench! Love the fabric, it’s beautiful! That project is done and looks great. Now maybe I’ll play some golf next week. Thank you Jane and Leo for the most beautiful view from our kitchen window. How cute Jane, it looks perfect and it’s the perfect hiding space. Pinning! That looks awesome!! Hubby is building me a potting shed and I want a potting bench inside with a skirt!! You have given me inspiration! 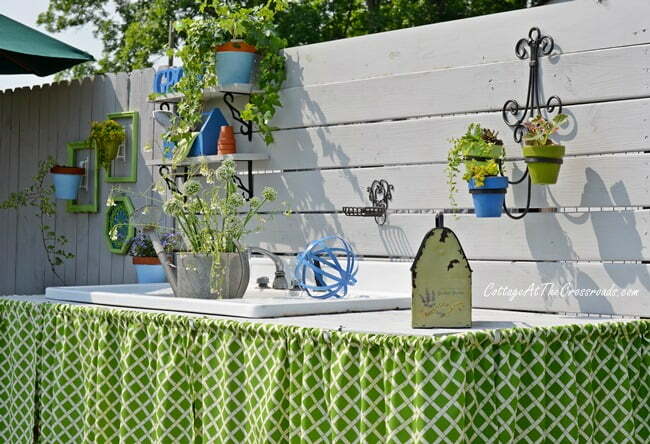 The potting bench skirt looks wonderful, Jane. 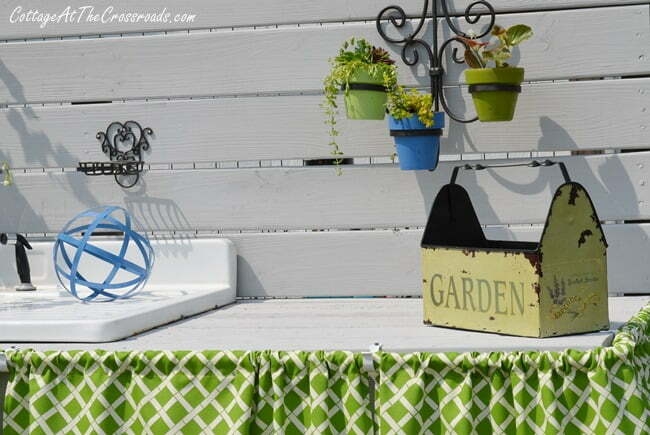 I love the color and the print, perfect for your outdoor space. I keep eyeing those orbs, too- I like the color you chose for yours.